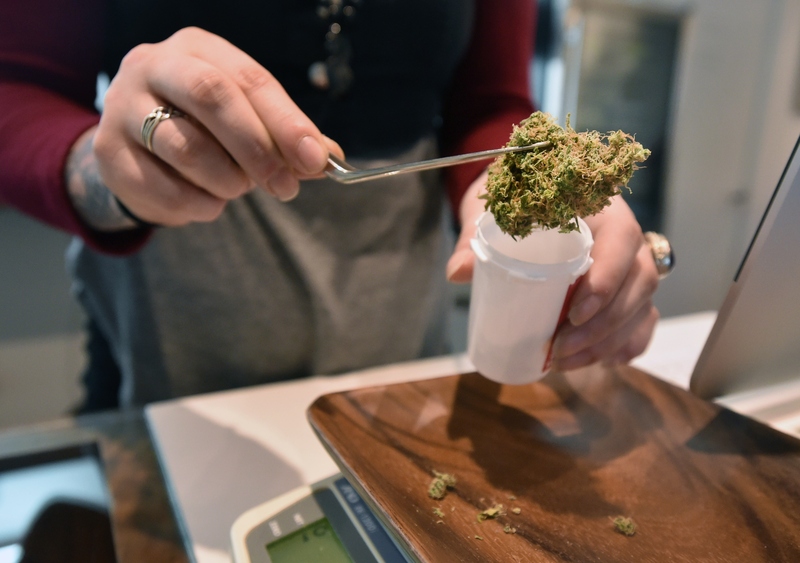 During the local election on Tuesday, Ohio voters chose to reject legalizing marijuana when they voted down Issue 3, an amendment that would have legalized both medicinal and recreational use. The Associated Press called the decision Tuesday night, stating that the amendment was failing 66 to 34 percent, with 36 percent of districts reporting. If the amendment had passed however, it would have allowed individuals over 21 years old to possess 1 ounce of marijuana, while any individual with proper prescription would have been able to access marijuana for medicinal reasons. The amendment would also have been a historic first — although 23 states and Washington, D.C., have legalized medicinal use and four states as well as the District of Columbia have legalized recreational use, voters have never approved the two uses concurrently. In every state that has thus far legalized recreational use, voters previously legalized medicinal use. But approval of medicinal use doesn't always lead to a more accepting voting bloc when it comes to recreational use. For example, California was the first state to legalize medicinal use in 1996 — yet voters have still not come to a consensus on whether they should fully legalize the substance. But what makes Ohio's decision truly interesting isn't the fact that the citizens voted against legalization, but why they chose to do so. Unlike other states that have legalized marijuana (for both medicinal and recreational uses), Ohio's Issue 3 would have dictated the means of growing and selling it as well as who could be licensed. If approved, the amendment would have established 10 Marijuana Growth, Cultivation, and Extraction facilities. These facilities alone would be licensed to grow and dispense marijuana within the state, which means any economic boost caused by legalization would only be felt by the 10 individuals who owned license farms. In effect, many feared that there would be a weed monopoly in Ohio, dominated by individuals like Nick Lachey, basketball player Oscar Robertson, and football player Frostee Rucker — otherwise known as the owners of the licensed farms. The proposed facility owners were among the strongest supporters of the legalization effort, something that apparently didn't sit well with Ohio voters. Those seeking to combat the possibility of a privately owned weed industry put forth Issue 2 onto the ballot as a secondary means of blocking legalization. Issue 2 — which passed — prevents the creation of a monopoly via constitutional amendment. Which means that if Ohioans want to readdress the topic of legalization, they'll have to come up with a different plan. But as a result of the division over the MGCE facilities, it's difficult to gauge how Ohio voters actually feel about legalization, though Ohio Gov. John Kasich tweeted out his support for opponents on Tuesday night, stating, "Proud Ohioans voted no on Issue 3 and instead chose a path that helps strengthen our families and communities. -John." Legalization in Ohio — especially in one sweeping vote — may have potentially turned the tide for legalization in other similarly conservative states. Now, the nation will have to wait for 2016 to determine both the fate of the presidency and of weed.